Fritz's Polka Band ("The only polka band to perform at a Woodstock Festival.") performs an eclectic mix of music, and breaks the stereotype regarding "polka" music. Fritz's Polka Band (FPB) was formed in 1978 by lead accordionist, the late Fred Scherz Sr., and his eight-year old son, Fritz, for whom the band was named. Sadly, Fred passed away on November 14, 2009, but FPB has vowed to carry on his legacy! Playing everything from modern-style polka to country to rock and even blues, FPB performs an eclectic mix of musical styles! FPB is NOT an oompa pa band or the stereotypical "polka" band. In fact, FPB is known for breaking the “polka” stereotype. FPB is the first polka band to perform at a Woodstock Festival (Woodstock ’99)! On October 7, 2010, FPB was inducted into the Syracuse Area Music Hall of Fame! FPB was sponsored by Jagermeister for over 12 years and is now sponsored by Coldcock Whiskey, an American herbal whiskey. Fritz’s Polka Band has made 18 recordings, which have achieved international airplay. Individuals of the band, and the band itself, have received some prestigious honors. As a group, FPB has performed on stage with "Canada's Polka King," Walter Ostanek (Grammy winner), "America's Polka King," the late Frank Yankovic (Grammy winner), LynnMarie Rink (Grammy nominee), and Glen Burtnik. Individually, Fritz has performed on-stage with Steve Augeri (former lead singer of Journey) and Charles Giordano (current accordionist/keyboardist for Bruce Springsteen). FPB has performed at B.B. King’s Club (2003), The China Club (2006), and The Metropolitan Club (2007) too! FPB even appears on "The Manchurian Candidate" DVD, released by Paramount Pictures in 2004! In 2011, FPB had two different songs appear in episodes of the hit cable TV show, ‘Breaking Bad’, which airs on AMC. Additionally, Fritz's Polka Band has shared the stage with Skid Row, Sean Kingston, New Boyz, Jimmy Sturr (Grammy winner), and BeauSoleil (Grammy winner), to name a few. FPB has played at: Woodstock '99, the New York State Fair, regional and county fairs, ethnic events, colleges, concerts, social occasions, corporate events, weddings, anniversaries, benefits, and multiple times at Musikfest (the largest free festival in the United States!). Fritz's Polka Band (FPB) was formed in 1978. Original members were: Fred Scherz Sr., as lead accordionist; Fritz Scherz on second accordion; Gabe Vaccaro on bass guitar; and Al "Rebe" Reber on trumpet. Vocals were done primarily by Rebe. It would be one year before the band would add a drummer. In 1979, Kevin Collins joined the band as the drummer. FPB was now a five-piece band, playing a variety of events ranging from weddings to county fairs. In 1982, due to many requests, FPB recorded their first album: "Fritz's Polka Band". It was a very exciting process, as none of the members had done a recording before. In 1983, Kevin left the band to attend college. After his departure, Doug Warner and Jim Swan shared the drumming duties. In 1984, Charlie Wolfgang joined Fritz's Polka Band as their full-time drummer. In 1985, Fritz's Polka Band released a 45rpm record. Frankie's Polka and Happy Birthday Polka were the songs on this release. Frankie's Polka was recorded in honor of America's Polka King, Frank Yankovic. Happy Birthday Polka was recorded for anyone celebrating a birthday. In 1986, Charlie retired. Once again, Fritz's Polka Band was faced with finding a new drummer. The search did not take long, as Rick Szczyt was given a tryout, and shortly thereafter, joined the band. Rick has been the drummer for Fritz's Polka Band ever since. In August of 1987, Rebe resigned from the band so he could raise his family. Again, Fritz's Polka Band was faced with replacing a member. To fill this position, Fritz's Polka Band chose a guitarist, Tom Campbell. Tom had played in a country/western band for over 30 years, and could also sing. At this time, Fritz and Tom began doing most of the singing. In December of 1987, Fritz began to play the Slovenian Button-Box accordion. This added a new dimension to FPB. In February of 1988, Fritz's Polka Band released their second album: "10 Years of Fritz's Polka Band." Fred wrote many of the songs on this album. In 1989, Fritz went to Gibbon, Minnesota to compete in the National Accordion Contest. This contest featured many fine musicians from all over the United States. Fritz was really proud when he won first place! In 1991, Frank Nelson started playing guitar and singing with Fritz's Polka Band. At times in the past, Tom was unable to perform with Fritz's Polka Band due to a hectic work schedule, so Frank also joined FPB. This was rather ironic, because Fred had played in a band in the 1950's with Frank's father, Jim. Frank and Tom both still perform with Fritz's Polka Band. In October of 1992, Fritz went to Ohio to appear on a videotape production with Canada's Polka King, Walter Ostanek. Many great musicians are on this video, and Fritz is honored to be part of it. On May 6, 1995, at Fritz's Polka Band's Annual Spring dance, before a sold-out crowd, Fred was presented a plaque from the Polka Fans of Central New York and the surrounding areas for "50 Years of Musical Excellence in Accordion Playing." In September of 1995, an official Fritz's Polka Band Fan Club was formed. On March 22, 1996, the band released their third album entitled: "Give Polka Music A Chance." This album was listed in the Top 10 Recordings of the Central New York Region for 1996 by the Syracuse New Times. Fritz's Polka Band is the only polka band, thus far, to make this exclusive Top 10. On March 5, 1997, Fritz's Polka Band released their fourth album entitled: "Can't Get Enough Of Polka Music." This album has some special guests on it: John Scherz on Swiss accordion, the late Arnold Scherz on chromatic accordion, and Melissa Allen on flute. In the fall of 1997, Fritz's Polka Band was nominated for some awards. Their "Can't Get Enough Of Polka Music" recording was nominated for "Record of the Year" by the Cleveland-Style Polka Hall of Fame in Euclid, Ohio. This recording was also listed by the Syracuse Newspapers as a Top 10 Central New York Recording. The Syracuse New Times listed this recording in their Top 12 Regional Releases. Also, in the fall of 1997, FPB was nominated by the Cleveland-Style Polka Hall of Fame for "Band of the Year." In Syracuse, New York, Fritz's Polka Band was nominated for a SAMMY Award: "Best Dance/Cover Band." The band celebrated their 20th anniversary in 1998. On May 29th, FPB released their fifth album entitled: "For All Our Friends." To commemorate their 20th year, a special anniversary dance was held on October 31, 1998. In the fall of 1998, FPB was nominated for many awards by the Cleveland-Style Polka Hall of Fame, including "Band of the Year." Fred and Fritz were nominated for "Musician of the Year." Gabe and Tom were nominated for "Sideman of the Year." Tom was also nominated for "Best Vocal Performance." In early 1999, FPB was nominated in Syracuse, New York for a SAMMY Award: "Best Dance/Cover Band." 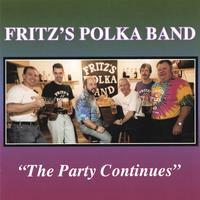 In April of 1999, a new recording from Fritz's Polka Band entitled: "Polka With All Your Might!" was released. On May 1st, the Mayor of Syracuse, NY, Roy Bernardi presented the band a proclamation for "Fritz's Polka Band Community Recognition Day." In July of 1999, FPB made history when they became the first polka band to perform at a Woodstock Festival! Later that year, FPB was nominated by the Cleveland-Style Polka Hall of Fame for "Record of the Year." In addition, Fred and Fritz were nominated for "Musician of the Year." Fritz was also nominated for "Button-Box Accordionist of the Year." Frank and Rick received nominations for "Sideman of the Year." In 2001, FPB won First Place in the Media Division of the Float Contest in Utica, New York's St. Patrick's Day parade. The band also released their eighth full-length recording: "The Party Continues." Later that year, Frank and Rick were nominated by the Cleveland-Style Polka Hall of Fame for "Best Musician/Sideman." FPB also placed in the "Top 10 Local Releases for 2001" by the Backstage Live Radio Show, based in Utica, New York. "The Party Continues" also placed in the "Top 10 CNY Releases for 2001" by the Syracuse (NY) Newspapers. WALN radio in Bethlehem, Pennsylvania placed FPB's Red Raven Polka in their "Top 25 Songs of 2001" list. WYMS radio in Milwaukee, Wisconsin selected FPB's Bialczak's Polka for inclusion in their "Best of Polka Parade 2001" list. 2003 marked the 25th year that Fritz's Polka Band had been performing. Many different events were held throughout the year to honor this. In April 2003, FPB released their ninth full-length recording: "A Taste of Switzerland." There are tunes on this recording performed using authentic Swiss instrumentation. John Scherz and Bob Zeller are guests on this recording. In September 2003, Gabe & Tom were both nominated for the "Sideman of the Year" Award at the Cleveland-Style Polka Hall of Fame in Euclid, OH. In October, FPB released "Jagermeister presents FRITZ'S POLKA BAND." This is a five song EP that contains the tune (It's Jager Time) Fritz wrote for their sponsor, Jagermeister, in addition to four other previously released tunes. In November 2003, Oneida County Executive, Joe Griffo did a proclamation naming November 8, 2003 as "A Day To Honor Fritz's Polka Band" throughout Oneida County, NY. On November 8th, U.S. Congressman Sherwood Boehlert presented FPB with an Official United States Congress Proclamation that honored the band. On December 12, 2003, FPB had the honor of performing as part of "Glen Burtnik's Christmas Xtravaganza" at the B.B. King Blues Club & Grill in New York City. 2004 was another busy year for FPB. Thoughout the year, FPB performed at many great events. Some of the highlights included: Bill Flynn's Polka Weekend, Adam Barthalt's Polka Weekend, Turning Stone Casino Resort Showroom (SOLD OUT! ), New York State Fair, Great Escape Oktoberfest, Hunter Mountain Oktoberfest, Glen Burtnik's "Christmas Xtravaganza," and many others. 2004 also marked the launch of FPB's 2nd official web site: www.fritzspolkaband.net. On November 27, 2004, FPB founding member/accordionist/vocalist, Fred Scherz Sr., was inducted into the Cleveland-Style Polka Hall of Fame, as he received the prestigious 2004 Trustee's Honor Roll Award. On December 10, 2004, FPB performed again at Glen Burtnik's "Christmas Xtravaganza," which was held at the State Theatre in New Brunswick, NJ. FPB had a busy 2005, which included the release of another recording, "FPB On Tap." This recording was released on April 5, 2005, and features 14 original tunes, ranging from tunes about partying, to songs about that are sort of silly, to tunes that are quite sentimental. On May 5, 2005, FPB merged their two web sites. By doing this, whether you go to http://www.fritzspolkaband.com/ or http://www.fritzspolkaband.net/, you'll get the same information that's up-to-date on FPB. On July 16, 2005, a special 75th birthday bash was held for FPB Member, Fred Scherz Sr. Fred received a special honor award from the Ag-Radio Network and proclamations from both the Town of Verona and Oneida County. In addition, he received a letter of recognition from New York State Governor, George Pataki. In addition, he received a U.S. Congressional Proclamation from FPB friend of many years, U.S. Congressman, Sherry Boehlert. Even the White House sent Fred a photo from President George Bush. 2006 saw FPB make history again, as they became the first polka band to perform at The China Club in New York City. In addition, FPB received multiple nominations for the Just Plain Folks Music Organization (JPFMO) Awards Show. And, on November 4, 2006, FPB won the "Best Polka Song" Award from JPFMO for Bialczak's Polka which appeared on FPB's 2001 release, "The Party Continues." On December 19, 2006, FPB released two new recordings: "Live at the New York State Fair" and "It's Christmas Time." 2007 was another busy year for FPB. And, once again, FPB made history by becoming the first polka band to perform at the famous Metropolitan Club in New York City on September 15, 2007! On May 30, 2008, FPB released their 16th recording, "Reflections." This CD will feature 14 original tunes by FPB and also includes a bonus track. In July 2008, Mike Faraino drummed his first gig with FPB. Mike had formerly drummed in Floating Noah, a very popular rock band in Central New York. Mike would end up drumming a few more times in 2008 with FPB. On November 1, 2008, Fritz's Polka Band hosted a 30th Anniversary Dance to celebrate FPB's 30 years of performing (FPB's first official gig was on October 14, 1978). On November 8, 2008, Fritz's Polka Band won an Upper State Independent Award in the International Category. Fritz's Polka Band started off 2009 in a special way by performing their song, 'Tribute' at the Corporal John P. Sigsbee Post Office Dedication in Waterville, NY. 2009 also saw Rick being busier with his day job and George being away, too, and not able to play. Thankfully, Mike was able to drum for FPB (sometimes at a moment's notice) and he ended up playing over 1/2 of the FPB gigs in 2009. In May 2009, Fritz's Polka Band received a nomination in the "Best Recording: Other Styles" category of the Syracuse Area Music Award (SAMMY) for the 2008 FPB CD entitled "Reflections." On June 5, 2009, Fritz's Polka Band won their first ever SAMMY Award for their "Reflections" CD. Mike and Fritz attended the award ceremony and accepted the SAMMY before a huge audience! On June 23, 2009, Fritz's Polka Band was nominated for the Just Plain Folks Music Awards in the following categories: Best Polka Song (Grandparent's Polka and It Doesn't Matter) from their "Live at the New York State Fair" CD) and Best Polka Album ("Live at the New York State Fair"). On November 7, 2009, Fritz's Polka Band won their 2nd Upper State Independent Award in the International Category. As with the SAMMY Award's Show, Mike and Fritz attended and picked up the award. Tragedy struck Fritz's Polka Band on November 14, 2009, when founding member, Fred Scherz Sr., passed away after a brave fight against liver cancer. Fred will truly be missed and FPB will never be the same. 2010 was FPB's busiest year to date and has brought some more honors. In August of 2010, FPB was nominated for Best New Recording by the Cleveland-Style Polka Hall of Fame In September 2010, FPB was nominated for an Upper State Independent Award. On October 7, 2010, Fritz's Polka Band was inducted into the Syracuse Area Music Awards (SAMMYS) Hall of Fame. On November 26, 2010, FPB performed at Tony Petkovsek's Thanksgiving Polka Weekend in Cleveland, Ohio, and was joined on stage by their great friend (and 3-time Grammy Winner!) Walter Ostanek, as well as Grammy winners, Joey Miskulin and Ronnie Sluga. The next day, on November 27, 2010, Fritz's Polka Band performed 'In Heaven There Is No Beer' during the Cleveland-Style Polka Hall of Fame Awards Show in Euclid, Ohio. 2011 was another busy year for Fritz's Polka Band, and it marked the first time FPB played in Vermont! Some highlighted gigs of the year included a fun crowd in Scranton, PA; a standing room only crowd at the New York State Fair; and a fist pumping crowd at the Adirondack Pub & Brewery in Lake George, NY as well as a festive audience at Brown's Brewing Company in Troy, NY. In August of 2011 as well as October, FPB had two songs featured in the hit cable TV show, 'Breaking Bad', which brough a lot of attention to FPB. Also in the fall of this year, FPB was nominated for an Upper State Independent Award. 2012 was another busy year for Fritz's Polka Band, and it marked the first time FPB had done a complete TV show (WSKG in Vestal, NY on February 4th) since founding FPB member, Fred Scherz Sr., passed away. By year's end, FPB had done 109 gigs. 2012 also marked a special occasion for FPB guitarist/vocalist, Tom Campbell, as Tom retired at the end of the year. The guys in FPB wish Tom a very happy and healthy retirement! 2013 marked an unprecedented four bus trips for FPB! From a Dyngus Day gig to a TV taping for WVIA to Bear Mountain Oktoberfest to a two-day Oktoberfest/Applefest combo, FPB had a blast doing four bus trips! On November 1, 2013, FPB released their 18th recording, a double-live CD entitled "The WSKG Sessions". 2014 saw Fritz's Polka Band go to more states outside of New York than ever, including New Jersey, Pennsylvania, Rhode Island, Georgia and Ohio. On August 7, 2014, Fritz's Polka Band received a letter indicated that each member had been nominated for a national award! Fritz and Gabe were nominated for "Musician of the Year" award by the Cleveland-Style Polka Hall of Fame, while Frank and Mike were nominated for "Sideman of the Year". 2015 marked another busy year as Fritz’s Polka Band that included a continuation of their monthly gig at Finger Lakes Gaming & Racetrack, a return to Pocono Downs for a WVIA TV Taping, and not to mention numerous summer concerts as well a return to the largest free festival in the United States, Musikfest and multiple Oktoberfest gigs! In 2016, Fritz’s Polka Band continued their monthly gig at Finger Lakes Gaming & Racetrack, yet another return to the largest free festival in the United States, Musikfest, multiple Oktoberfest gig as well as four gigs in Virginia, and their first ever gig in South Carolina! Over the years, members of Fritz's Polka Band have performed on stage with these polka legends: the late Frank Yankovic (America's Polka King), and Walter Ostanek (Canada's Polka King). Incidentally, Frank Yankovic won the first ever polka Grammy Award, and Walter has won three. These two musicians have really done a lot to inspire FPB.